After you start a search, HoudahSpot moves the keyboard focus to the search results. You can then navigate results using the arrow keys. Press return to open the selected files. When the search brings up too many results, you will want to refine it. One way to do so is to add to the search field at the top of the HoudahSpot window. You may now be tempted to reach for the mouse to click the search field. Don’t. You can move keyboard focus to the search field without your fingers leaving the keyboard. Press Command-Option-F. This triggers the Search > Search… menu item and puts focus on the main search field. Press the Right Arrow key to place the insertion point at the end of the field. 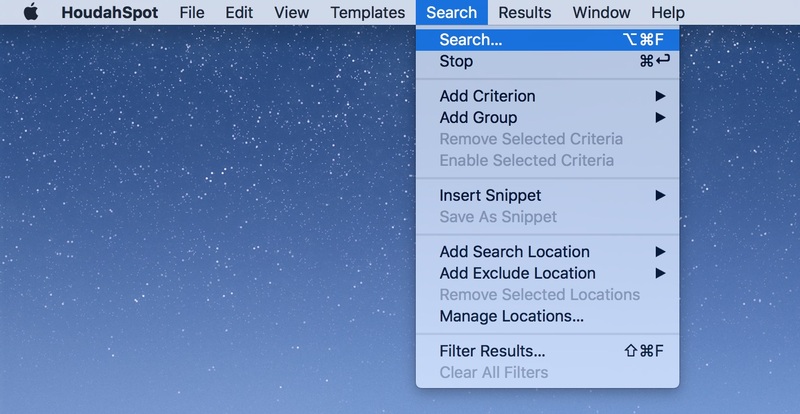 Similarly, the Command-Shift-F keyboard shortcut maps to the Search > Filter Results… menu item. This puts keyboard focus on the filter field above search results.